home Home arrow_right Forums arrow_right Discussions arrow_right General arrow_right which minecraft website did you know first? I kinda want to know what is the first minecraft website people knew, or like your first minecraft website you knew. For me it was on a a diff website than all of these. But I was just curious lol uwu bye. edit: don't say minecraft.net that's obvious. And I mean "fan site"
PMC: your on the website. Poll ended 03/19/2019 8:30 pm. it was a legit website called Minecraft for free it was a browser version of Minecraft and I played the heck out of it! Well.. the first website i knew was The Official Minecraft Forum. What about Minecraft.net. I love reading all the builds they feature there. Also I love reading about the new updates. Oh also the Minecraft wiki. I went to all sorts of weird modding sites, so I'm not actually sure. The first one I remember though is PMC and some website called MinecraftMods. Minecraft-related site? Does the Apple app-store count? The first time I played Minecraft was on an iPod Touch, then moved over to PC somehow. I was talking about minecraft fan sites not the actual minecraft website. Either the wiki or the skindex was the first. Now that I found it, PMC is the main one I use. You forgot Minecraft.net - technically the first Minecraft site that everyone visited because that's where you buy the game. Minecraft Forums, Minecraft Wiki and Planet Minecraft (in that order), were the next three Minecraft-related websites that I came across. I was talking about minecraft fan sites. I mean honestly, the very first Minecraft website I knew about was Mojang but ya know..... Yeah, I'll show myself out. https://www.minecraft.net/en-us/ was the first Minecraft website I visited, that's where I bought Minecraft. I'm talking about fan sites. It was probably Miners Need Cool Shoes or the Minecraft Forum. 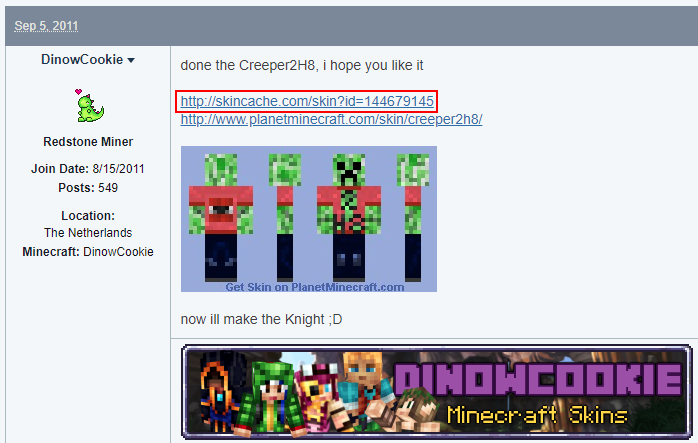 However, while I am still pretty active on MCForum I no longer make my skins on MNCS. PS: Not counting the Mojang site to actually buy the game. PMC was the first website﻿ I found, but I used an app (Minecraft Skin Studio) for a while before that.